Tracks 1- 3, 5, 8-9, and 11 recorded at the Johnson Theater, University of New Hampshire on Sep. 9, 2013. Tracks 4 and 6-7 recorded at the Spire Center for the Performing Arts, Plymouth, MA, on Nov. 12, 2016. Track 10 recorded at the Johnson Theater, University of New Hampshire on Jan. 31, 2011. “sound” has remained constant due in large part to the distinctive cornet styling of the leader, Tony Pringle, aided by the steady pulse supplied by Peter Bullis on banjo, the two musicians who were, as the back inlay says, “the soul and backbone of the band for forty-seven years.” The back line has always provided a rhythmic, but light, 4-beat base on which the front line could dance, regardless of whether the bass instrument was brass or string. The rhythm was—and is—never ponderous, one on which the inimitable Pringle led the ensemble on cornet. So it was a significant blow to the band when both of these stalwarts passed away during the last year, and in part the album’s title, Missing Pieces, is an acknowledgment of this—Pringle and Bullis are the missing pieces, as Billy Novick intimates in the brief note on the CD insert. The title also alludes to the previously unreleased recordings (hence “missing pieces”) of songs from three concerts, again according to the note. Two of the tunes appear for the first time on a NBEJB recording: I’ll Fly Away and Bienville Blues. The first is a spiritual that has become increasing popular with New Orleans bands these last few years and was a favorite of Pringle’s, Novick tells us, here finally appearing on record (“about time,” Pringle might say) by the band. The other, Bienville Blues (better known perhaps as Storyville Blues), is given a very improvisational treatment, making it virtually a “new” but interesting tune. Of the other tracks, many are not too often heard by the NBEJB—or any other bands, for that matter. Lonnie Johnson made Tomorrow Night his theme song, giving it a blues treatment, but few bands seem to have picked it up and I must confess it is not in my top twenty. Red Man Blues is taken at a fairly brisk tempo compared to other recordings of it by the band, but it is still a captivating tune, although here it is lacking the “Indian tom tom” effect that Pam Pameijer used to give it. On two previous CDs Black Eagle Skuffle, a band original, was included, but I have not heard it done by any other band. Quite a few bands, however, have added the Mardi Gras Indian tune Iko Iko to their book of late, although it has been around for several decades since it was a hit for the Dixie Cups female vocal group back in the sixties and covered by rock and pop singers and groups thereafter. It was previously recorded once by the NBEJB in 1992. It was done fairly spontaneously. Jesse didn't even know the tune, so I wrote out the chords for him during the intermission. Both Tony and Peter were very supportive of my doing things outside the New Orleans realm, and audiences seemed to enjoy the "digression." After we finished playing it, Tony came up to the mic and told the audience "That was absolutely beautiful- a bit different" ...and then, of course, did his Tony chuckle. I actually have him recorded saying that and was going to let the track keep going up to that point it but I decided it was too schmaltzy. But this cut was my personal tribute and musical farewell to them [ Pringle and Bullis]. One might argue that it is not jazz, but at the same time one must agree that it is very beautiful. Novick’s variations are extremely moving against the most sympathetic backing of Williams on string bass; fortunately—and appropriately—it was included on this CD. These recordings may well be the last on which Pringle and Bullis appear with the New Back Eagles, unless perhaps others are found in the band archives and are deemed worthy of release. This CD, Missing Pieces, is a well-deserved tribute to these two musicians whose presence in the band will be sorely missed. It engenders images never more to be seen of Pringle, slightly hunched, cornet pointed down, squeezing the notes from his horn and Bullis, seated, red socks prominently on display as he strums his banjo. 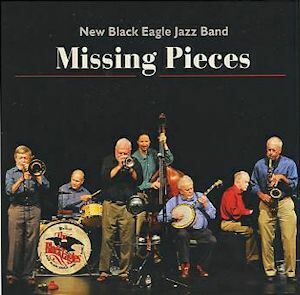 All fans of the New Black Eagles Jazz Band will want to have this album. At the band’s web site < www.blackeagles.com> one can obtain more information on this and the other CDs by the band.